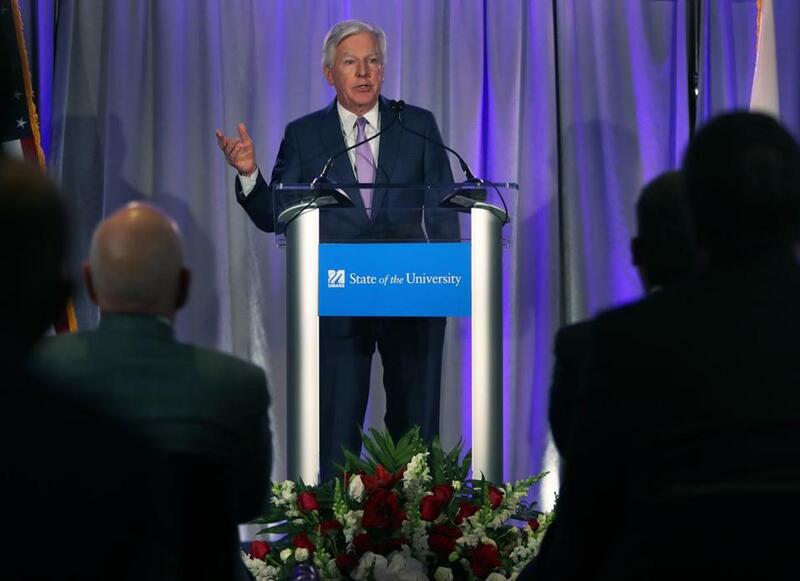 UMass president Martin T. Meehan hopes the system’s new online initiative will help ensure UMass’s long-term financial sustainability while reaching adults who may have limited employment opportunities. Five years ago, with much fanfare, the University of Florida introduced a bold online degree venture, aiming to reach tens of thousands of adult learners in the state and beyond. Officials imagined 24,000 students and $77 million in revenue by 2023. But it didn’t take long for Florida officials to dramatically scale back their ambitions, as the online school found it difficult to recruit students and win over faculty. These days, they’re aiming for a modest 8,400 students and $29 million in revenue, which includes a $5 million subsidy from the state. Florida’s experiences — and those of other public universities with similar enterprises — offer cautionary lessons for the University of Massachusetts, which is planning to launch a new online college that will compete for students from across the country. A handful of public universities, including Arizona State University, Pennsylvania State University, and the University of Maryland, have built successful, large-scale online enterprises. But others have quietly folded after struggling to recruit students, ensure a quality education, and manage costs. Last year, the University of Texas at Austin shelved a multimillion-dollar plan to reinvent undergraduate education with a focus on growing online enrollment — just two years after launching. The online initiative was introduced with much ceremony last week by UMass president Martin T. Meehan, to an audience that included Governor Charlie Baker, state legislators, and city mayors who made their way to the UMass Club in downtown Boston after a morning snowstorm. Facing declining enrollment of students from Massachusetts and limited support from the state government, Meehan said the online college will help ensure UMass’s long-term financial sustainability while reaching adults who may have limited employment opportunities. The online college would be a separate enterprise from digital courses UMass currently offers at its campuses. It would be aimed at adult learners, and admissions would likely be less competitive and open to more students. The head of UMassOnline is Don Kilburn, a former executive with United Kingdom-based Pearson PLC, an education publisher that has worked with US public universities to expand their online offerings. Kilburn said he has spent the past year talking to other universities about how to model UMassOnline, and is aware of the potential pitfalls. But he believes UMass has the elements to succeed and offer adult learners a quality education. Just within Massachusetts there are more than 1 million adults age 25 and older who are considering some sort of college degree, he said; and beyond the state, Kilburn said, UMass is a nationally recognized brand that could appeal to students. Meehan and Kilburn hope the online college will one day bring in $400 million in revenue and employ 500 to 1,000 workers. The online school would likely rely on adjunct professors to teach classes, although UMass faculty would be asked to help, by designing courses, for example. It is unclear how many students UMass hopes to enroll, but many of the largest programs at other public universities have anywhere from 24,000 to 44,000 exclusively online students. UMass has not detailed how much it will cost to run the enterprise, but Meehan said the university would borrow money to get it underway. While the UMass system maintains a high credit rating, agencies such as Fitch and Moody’s have warned the institution about taking on large amounts of additional debt. Kilburn said the university is still deciding the timeline for the launch, where the school and its staff will be located, and the price of tuition and fees. UMass also needs approvals from regulators and has been in touch with the Massachusetts Department of Higher Education and accrediting agencies, Kilburn added. But even a report presented to UMass trustees last fall acknowledged the hurdles ahead, especially for a public institution. Only the University of Maryland’s University College and Purdue Global University enroll more than 10,000 students and have revenues of more than $400 million. Maryland took nearly a quarter of a century to get that large, growing the program through its relationships with the military and veterans. And Purdue University recently purchased the struggling for-profit provider Kaplan University to jump-start its online program. Arizona State University had to persuade faculty to teach and design courses at the online venture, make changes to its business operations, and increase spending on technology and hiring, said Phil Regier, a university dean who runs the digital learning arm, ASU EdPlus. After about a decade, the program now has some 25,000 fully online students and offers 180 degree programs. Even so, there are daily challenges traditional schools don’t face: chasing down transcripts for transferring students, for example, or having staff available after hours to answer questions. For UMass to compete with established programs, higher education experts said, it will have to make robust investments. And one of the powerhouses of online academia is just up the road: the private, nonprofit Southern New Hampshire University. SNHU enrolls more than 93,000 students from around the world — including 15,000 from Massachusetts. It has flourished as many for-profit universities retreated from the online market after coming under intense government oversight because of high student debt loads and questionable degrees. SNHU brought in about $95 million in net income in 2016. But even that success comes at a high cost. Marketing remains a huge expense, as SNHU spent $133 million on recruiting students that year. Howard Lurie, a principal analyst with Eduventures Research, a Boston-based consulting firm, said UMass cannot look at the online school as just a business venture. As a public institution, UMass needs to ensure its online programs are providing students, many of whom may have previously struggled with college or are not prepared academically, with the support they need to succeed, Lurie said. These students benefit from more one-on-one attention and support, which are expensive to provide and can be lacking in purely online programs, he said. Cummings, of the University of Florida, said the ambitions outlined by Meehan last week sounded familiar.